Keeping an octopus is one of the trickiest things you can undertake. However, it is without doubt one of the most rewarding. Highly intelligent and often keen to interact with their keepers, octopuses are engaging pets which can become as much a part of your life as a cat or dog. They are pets you will really grow to love, though the natural lifespan of most species is under two years, so be prepared for heartache when you lose them. To keep them safe in the meantime, and to ensure that both of you get as much out of the experience as possible, it's important that you understand their complex care requirements. There are several species of octopus commercially available, though finding one at all can be difficult. Many fish shops don't know much about them and may misidentify them. Some have even been known to sell dangerous species like the blue ringed octopus, which could easily kill its owner! Before you buy an octopus, make sure you have correctly identified it and researched its individual needs. Try to buy a young specimen so that it will last as long as possible, but make sure it doesn't belong to a species which will grow too big for your aquarium. Creating a home for an octopus requires particular care. They are generally happiest when kept alone - they will eat smaller fish and be intimidated by bigger ones, no matter how peaceful. Give your octopus the biggest aquarium you can, as this will give it room to explore and will also help you to keep the water parameters stable. Use a soft, smooth-grained sand for the substrate and make sure there are plenty of hiding places - aquarium rock arranged to create a cave is good, but your octopus will be strong and will heave itself around, so make sure none of the rock could fall and injure or trap it. Octopuses are highly curious animals. They're very dexterous and they're natural escape artists. For this reason you will need to use immovable tank covers and a locking aquarium hood. Make sure that any pipes which extend through the hood are blocked off with wire netting or sponge, even if they're really narrow, otherwise your octopus may be able to climb through them. Different species of octopus require different levels of salinity, pH, and temperature, but all octopuses are extremely sensitive to change, so it's vital that you keep conditions stable. Some tropical fish enthusiasts use computer monitoring to achieve this, as even a temporary upset can be enough to kill your octopus. Equally important is that you avoid having any nitrates or ammonia in the water. Because it eats so much to supports its complex body and large brain, an octopus produces three times as much waste, proportionally, as a fish, so you will need to use heavy filtration and change the water regularly. 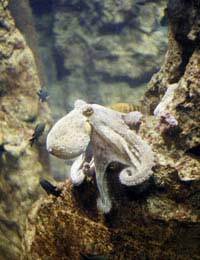 Octopuses are extremely sensitive to the presence of metals in the water, so make sure your tap water is properly treated before it enters the aquarium. It may be worth your while to invest in a reverse osmosis water treatment unit (usually just over £100) in order to be safe. Never use any metal-based medicines in the octopus' aquarium. You'll also need to make sure that the water in your tank circulates well and that it is well oxygenated, as octopuses need high levels of oxygen in order to thrive. On account of these complex requirements, it is necessary to cycle your aquarium for at least three months before you add an octopus to it. Naturally you'll be feeling impatient, but you'll find that it's well worth the wait. Octopuses are shy creatures, and they're distressed by travelling, so a new octopus may take some time to show itself. So long as it's eating, this should not be a cause for concern. Most octopuses are happy on a diet of cockles, though you should clear away any shells afterwards to avoid injury. Because they're so intelligent, octopuses can become physically ill if they're stressed or bored, so playing with your octopus is as important for its well being as for your pleasure. Try to make some time for it every day. You can give it any kind of toy provided it's made of marine-safe plastic (ask your fish shop for advice). Simple things like balls and tubes can become favourite playthings, but octopuses are also interested in complex items, and have even been know to solve Rubik cubes! Looking after an octopus is very hard work, but no other pets can offer you a remotely comparable experience.